Sterling silver, real Turquoise, Coral, Malachite, Brown Shell, Abalone Shell and Yellow Mother of Pearl. The inner bracelet circumference measures approximately 5-1/4", plus a 1-1/8" opening, and 1" at widest point. This lovely bracelet is a work of art and has everything you could possibly want from a piece of Native American jewelry! 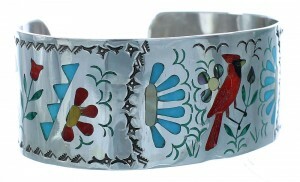 This piece of Native American jewelry is Zuni hand crafted by artist Samuel and Esther Guardian, out of genuine sterling silver and real Multicolor inlay. The inlay consists of: Turquoise, Coral, Malachite, Brown Shell, Abalone Shell and Yellow Mother of Pearl. 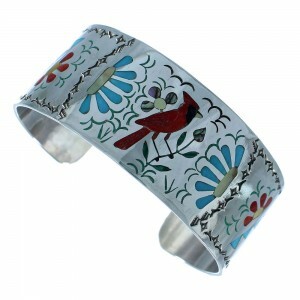 The inlay is carefully set creating a wonderful Cardinal design and flower patterns. 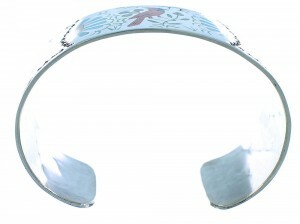 Hand cut silver work highlights the bracelet for a delightful look. 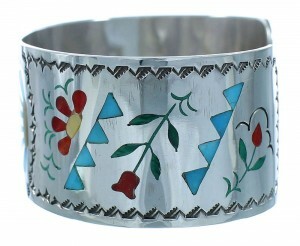 The bracelet is stamped signed Zuni, and is hallmarked by the artist. 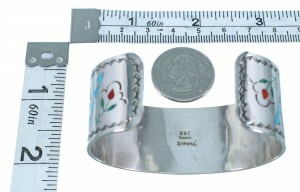 The inner bracelet circumference measures approximately 5-1/4", plus a 1-1/4" opening, and 1" at widest point.